Dr. Rosen is a graduate of the University of Texas Southwestern Medical School. He completed residency training at New England Medical Center—Tufts University School of Medicine and a fellowship in Vascular Surgery at Tufts—Boston VA Medical Center. 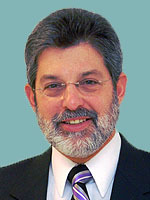 Board certified in General Surgery, Dr. Rosen is past president of the St. Luke’s Hospital Medical Staff, a past member of the Board of Trustees of Southcoast Hospitals Group, and past chairman of the St. Luke’s Hospital Medical Executive Committee and former chief of surgery at St. Lukes’ Hospital. He has practiced in the New Bedford area since 1988 and is a member of numerous professional organizations including the American College of Surgeons, American Society of General Surgeons, New England Society of Vascular Surgery and Massachusetts Medical Society.